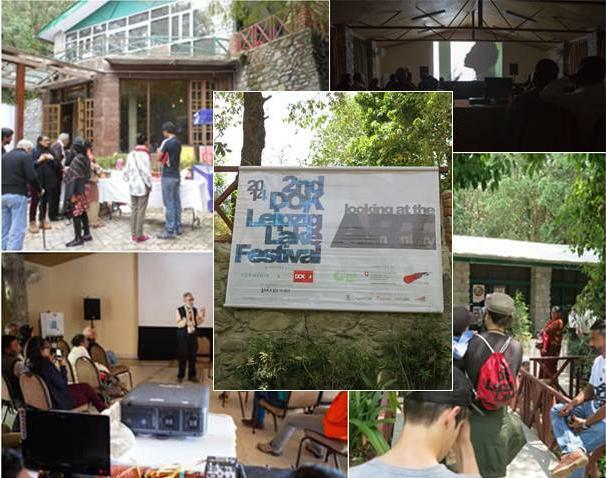 The second edition of the DOK Leipzig Lake Festival of documentaries was held between April 17 to 21, 2014 at The Lake Resort, Naukuchiatal, Uttarakhand, India. It was a non-competitive festival, essentially dedicated to an abandoned intellectual and cultural space in a stress-free environment .The highlight was to initiate conversations around documentary, more on the form than the content. On the struggles and choices documentarians make and the why of it. On the issues of ethics and confidentiality and how it affects the form – and can lead to even greater creativity if a film-maker strives for it. Based on the idea of ‘Documentarian’, the festival had great evenings of informal debates around the constraints in documentary film-making as it was, is and may be. Several documentary filmmakers, critics and programmers attended the festival. Parul Wadhwa had the opportunity to interview a few of them regarding their impressions of the Festival. Fernand Melgar-documentary filmmaker (Special Flight), Switzerland. Q. What is the historical importance of DOK Leipzig? And in that framework, how do you see the value of holding an Indian edition of DOK Leipzig? A. Claas Danielsen: DOK Leipzig was founded in 1955. When we celebrated the 50th edition I did some research and to my great surprise found out that our festival seems to be the oldest documentary festival in the world. In the 1960s and 1970s the festival was a meeting place for the greatest international "documentarians" of their time while the 1980s became a darker chapter in the festival history with pressure and censorship by the East German authorities. Nowadays, after the unification of Germany, DOK Leipzig has become the second biggest European documentary film festival and one of the leading events of its kind in the world. For us it is a great honour to have been invited by Neelima Mathur to curate a programme of the finest documentaries we have shown in Leipzig for the Lake Festival in India. The Lake Festival offers documentary professionals as well as a general audience of cinephiles the opportunity to discover outstanding international documentaries. We hope to get into good contact with Indian filmmakers and to make our festival better known in the Indian documentary community. Q. What are the main gaps/needs in the documentary filmmaking sector when it comes to Asia-Europe collaborations? A. Aruna Vasudev: The DOK Leipzig Lake Festival is a wonderful initiative to take deeply meaningful documentaries to young and older people outside the metro centres. All these decades, everything has always been designed for the urban audience but the large majority of people live outside the urban centres. There are definitely gaps and needs in this sector with little enough information and networking available. The Lake Festival can form a bridge by bringing more European documentary filmmakers to the festival to hold discussions and talks with both aspiring filmmakers and also with educational and cultural institutions around the area. Perhaps the Lake Festival could hold one or two workshops on documentary filmmaking in Naukuchiatal itself, where information on funding within India and in Europe, could also be disseminated. A. Deepti DCunha: Lack of funding is a constant struggle with documentary filmmakers but there is also a definite and urgent need for information to be available to all aspiring documentary filmmakers about sources of funding. In terms of networking platforms there are some initiatives but not enough. In my opinion, the most important step for documentary filmmaking in India( I can’t speak for Asia) is audience development. As long as people in India are not interested in documentary as a form of film and are unwilling to engage with this form as audiences, most initiatives are bound to fail. Hence documentaries, which are right now post college viewing experiences, have to be introduced to a much larger section of people at a much younger age. In this aspect DOKLeipzig Lake festival at Naukuchiatal can be instrumental by having workshops for selected projects of filmmakers where they can be creatively mentored with the expertise of people associated with the festival, either from DOKLeipzig, Germany or any other partners. The session with Fernand Melger this year at the lake festival, for example, was extremely enriching. Such exchange of ideas should continue by inviting interesting documentary filmmakers to share their experience and approach to their craft. Q. As a filmmaker from Europe, what is your impression of the Lake Festival? Any special features that interest you as a filmmaker? A. Fernand Melger: The Lake Festival is a very interesting festival. First of all because it makes you discover an unknown Indian Region. As we primarily always think about the hub of Delhi or Mumbai, we cannot imagine that in the region of the festival are so many people passionate for documentaries. The festival allowed me to discover an Indian filmography and to create links with Indian directors, producers and journalists, which is quiet rare. Q. Could you describe the process of curation used in the Dok Leipzig festival? Could you also elaborate on the larger vision of the Dok Leipzig festival to start a Lake edition? A. Claas Danielsen: The above mentioned description of what a good documentary is to me defines important aspects of what kind of films we as festival programmers look for. We try to show the best new documentaries from all over the world at DOK Leipzig which we choose out of approximately 3,000 films that we screen every year. New trends and tendencies in international documentary filmmaking are reflected in our curation which tries to assemble the finest works of their kind in the festival. The programme of the DOK Leipzig Lake Festival is much smaller than the one of our festival. Therefore we select the best of the best of what we have previously shown in Leipzig for this fine festival in India. These films should stand for the diversity and high quality of contemporary documentary which we bring to the small and very niche audience of the Lake Festival. These interviews were conducted as part of a media partnership between the ASia-Europe Foundation online portal culture360 and Formedia (India), arranged and designed by Parul Wadhwa, an independent documentarian (India/USA). We thank for the additional support Anupama Sekhar, Asia-Europe Foundation (ASEF) and Neelima Mathur, Formedia(India).